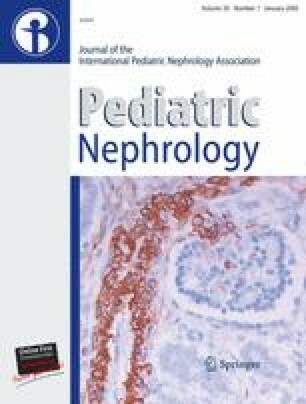 The aim of the study was to investigate (1) whether there are any changes in release of platelet-derived growth factor AA (PDGF AA) in children with nephrotic syndrome without clinical thromboembolic symptoms 2; (2) whether serum PDGF AA correlates with the platelet count (PLT) and platelet indices; (3) whether prednisone therapy affects the serum PDGF AA and the PLT; (4) whether PDGF AA is a useful predictor of disease activity. The study involved two groups of children: 33 with nephrotic syndrome (I) who were evaluated twice (A during relapse and B after 2 weeks of prednisone treatment) and 34 healthy children (II). The serum concentration of PDGF was measured by ELISA. In group I/A the PLT ( P <0.01) and platelet distribution width ( P <0.05) were elevated, the mean platelet volume (MPV) ( P <0.05) was decreased and the plateletcrit ( P >0.05) was normal. In group I/B, the PLT was decreased and MPV increased. The concentration of PDGF AA was still increased and correlated negatively with the albumin concentration. Hence in children with nephrotic syndrome an increase in PLT, a decrease in MPV, and a higher concentration of PDGF were observed. Treatment of nephrotic syndrome with prednisone for 2 weeks is not sufficient to normalize platelet parameters. Further studies are necessary to confirm the role of PDGF AA in the hypercoagulation state in children with nephrotic syndrome.